A Prunus domestica L. cultivar. ‘Branches smooth. Fruit pretty large, oval, about two inches and a quarter long, and one inch and three quarters in diameter, swelled much more on one side of the suture than on the other. Stalk one inch and a quarter long, slender. Skin pale green on the shaded side, but of a deep red colour, with numerous grey specks, where fully exposed to the sun, and covered with a very thin blue bloom. Flesh yellowish green, and separates from the stone. Juice harsh, subacid. Stone oval, sharp-pointed. Ripe the beginning and middle of September.’ [George Lindley – Orchard guide p.457/1831]. ‘Once popular, Red Magnum Bonum is now but of historical interest. Three centuries ago this variety was cultivated in England by John Tradescant under the name Imperiall. It was mentioned by all of the early horticultural writers and it seems clear that the variety was well established in Europe at least as early as the beginning of the Seventeenth Century. As all plums at that time were propagated from seed, a large number of sub-varieties of this sort were produced and as these became established the nomenclature of the variety became much involved. In 1729 Langley called it the Red Magnum Bonum, a name it has since retained.’ [Plums of New York p.326]. Figured in Pomona Britannica [PB pl.XVII/1812]. 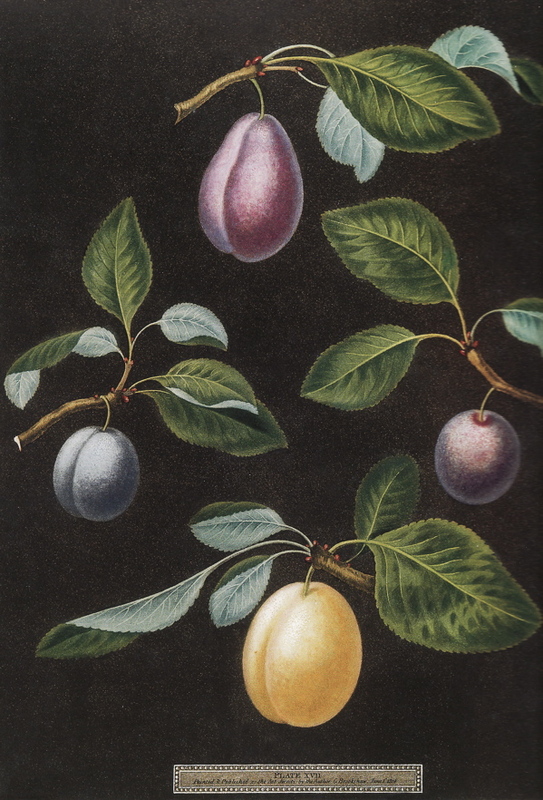 Listed in Addenda to the 1857 catalogue as ‘Magnum bonum’ [Plum no.23/1857]. See also ‘White Magnum Bonum’. The identification of this plum is uncertain. ‘Magnum Bonum’ without further elucidation usually applies to ‘White Magnum Bonum’, which see, and this is perhaps a more likely identidication than ‘Red Magnum Bonum’. Prunus domestica ‘Red Magnum Bonum’ | PB pl.XVII/1812. Red Magnum Bonum is the top plum. Also figured are Blue Perdrigon, Le Royal and White Magnum Bonum.